However, Burke promised the two-dimensional words on the page would be transformed into a topography with mountains and valleys – no commentaries or dictionaries needed. She invited us into a “text-based dialogue” and told us we would take a “vocal and physical journey” with the psalms. Rather than scripture study, we would engage in scripture immersion. From an early age, Burke loved language and the spoken word. As a child, she played with language, accents, music, and the range of capacities of the human voice. “Language is alive and moving, never frozen and always changing,” Burke explained. She followed this passion for language by double majoring in French and drama as an undergraduate, and then pursued a Masters of Fine Arts in Acting. Burke became a Shakespeare specialist and developed a passion for this approach, which is based on meaningful repetition of the text. In the same way that children can watch the same Disney movie dozens of times and always find something new, Burke argues that voicing the same text over and over deepens our engagement with it. Voicing a text together builds community among actors, as well as enhancing an actor’s relationship to the text. Burke, now an associate professor in the Department of Drama at the University of Virginia, went on sabbatical in 2010. She traveled to eight countries over six months, doing text-based work with playwriting students, Shakespeare ensembles, and other theatre groups. She returned to Virginia energized to continue text-based work, and was invited by Rev. Dr. John P. Chandler – a leader among Baptist clergy – to lead a workshop for preachers on voice presentation skills. She had the idea of bringing a Scripture passage and working it the way she would work a Shakespeare passage, and chose a section from Ezekiel for her workshop with Baptist clergy. As Burke led them through the text – breaking it down line by line, word by word, exploring the architecture of the words – there was a moment everyone in the group was so moved by the proclamation that they were suddenly, simultaneously silent. 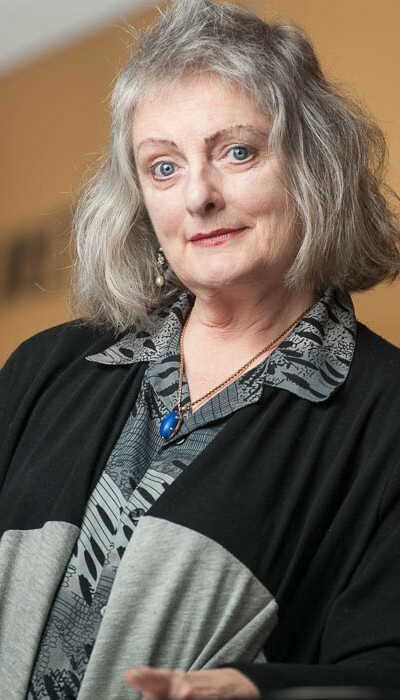 This theophany planted a seed in Burke’s heart since she is not only a vocal coach, actor and Shakespeare specialist, but also a cradle Catholic who has gone to Mass weekly for her whole life. Like many of us, she has heard scripture proclaimed and homilies preached Sunday after Sunday. Burke sensed that the veil can be parted and began to intuit a divine call to minister to preachers, presiders and proclaimers with the text-based approach she had learned at the Royal Shakespeare Theatre. Her ministry was born out of discernment of the call to use her decades of theatre training and experience and her passion for the spoken word to enhance liturgy. She encourages participants in her workshops to form a “reading huddle:” to stand in a tight circle, imagining they are the earliest believers in the catacombs, half-expecting Roman soldiers to burst in at any moment as they proclaim the words of scripture in unison to encourage one another. This exercise led one participant to share that “it felt like someone walked in here with a papyrus and unrolled it, and we heard that reading for the very first time” – which is probably the most that any proclaimer could hope to achieve in her or his proclamation. At the end of the evening, Burke closed the session by inviting each of us to proclaim one of the psalms. After having waited my turn to proclaim one word or one line, the opportunity to proclaim psalm 130 in its entirety to the group felt like a tremendous privilege. The ancient words of lament and hope – which have been chanted, sung, and proclaimed for millennia in hundreds of languages – had become paradoxically both more my words and more our words. Psalm 130 had become at once personal and universal. I had found I could, in fact, engage meaningfully with scripture texts even without a pile of dictionaries and commentaries. We had voiced the words in more ways that I had imagined were possible. We had walked around the sanctuary, we shouted the words at the same time, creating a cacophony. We had chanted the words in unison. We had whispered the words. We had declared the words line by line. We had stood shoulder to shoulder, leaning in against each other as we announced the words. I had heard the words proclaimed in the voices of six other women gathered. The psalms felt like old friends. Indeed, the two-dimensional words on the page had become three-dimensional, just as Burke had promised. More than once we had been moved to tears. This entry was posted in Spirituality, Uncategorized, Women & Gender and tagged Catholic Church, Catholic women in ministry, Catholicism, discernment, Kate Burke, Lectio Divina, preaching, proclaiming, Psalms, Scripture, theatre, vocation by Rhonda Miska. Bookmark the permalink.